Last Sunday afternoon saw the culmination of my summer project when I crossed the finish line of the Loughrea Sprint Triathlon. A sprint triathlon is exactly half the distance of the Olympic standard, so it was a 750m swim, then a 20k cycle, then a 5k run. I finished in 1 hour, 40 minutes, 23 seconds, coming in 232nd out of a field of about 300, including relay teams. I am very happy with this result. I was racer number 47. I know this because it’s still written in permanent marker on my right shoulder and left calf, and it won’t come off. Not being a strong swimmer, my days before the race were filled with visions of being towed out of the lake by a safety kayak. Before we started I found a nice spacious area in the water at the very rear of the pack (triathlon swims are notoriously aggressive), and hung in there for the 24 minutes it took me to finish the swim. I got out of the water with about twenty people out of the whole race behind me. Despite that fact that it lashed rain throughout the entire race, I made up some time after that. I actually found the cycle quite easy going, maybe because we were forced to ease off a bit due to the surface water on the road, maybe because I could have been pushing harder. The end of that last sentence, by the way, is what I suspect drives many competitors back to do it all over again in subsequent races. Although I remember feeling that the race was incredibly tough at the time and pushing myself to the limit, somehow now I can’t quite appreciate how that actually felt. And so part of me can’t be sure that I couldn’t do better. I am nearly certain this is due to some evolutionary trick of self-preservation that my brain is playing with my memory, because the rational part of me knows it hurt like hell. Coming off the bike and transitioning to the run was quite tough. My legs were pretty wobbly and at the start of the run and I was practically dragging my toes along the road. I found my stride after a few minutes though, and by the end of the run I was feeling fine, almost like I could have kept going. Another mind trick, no doubt. But that was it. 1:40:23. I went home and had the most glorious shower of my existence. Lessons learned? Take your feet out of a bicycle’s toe clips well before trying to dismount. Endorphins should be bottled. Don’t listen to advice you read online; anyone who bothers to write anything about a specific subject on the Internet is too consumed by their respective interest to be considered impartial. Sports psychology is a really deep subject. I trained for about ten weeks before the race. It wasn’t enough to just run around in big circles though; I had to run around in big circles, and then make graphs about it. Getting better at running is difficult in the same way that it’s hard to notice someone get taller or older-looking. You really need to look at the marks on a height chart or flip through a photo album to appreciate the gradual change over time. When I started training for the triathlon I wrote a simple script to tally up the number of runs I had done and overlay the output on my desktop, a constant reminder that I was actually making incremental progress. I’ve basically ported that script to the web, and you can use it if you like. 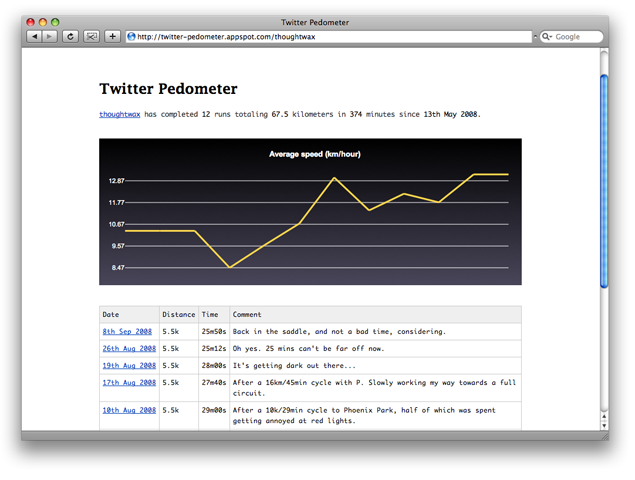 If you’re on Twitter, send a message to @pedometer with details of your run and it will appear on Twitter Pedometer. It’s like a lo-fi version of the Nike+/iPod thing. Over time, you’ll hopefully notice yourself getting better. Here’s what I did to prepare for the triathlon.